Those who chronicle the Sport of Kings tend to cry wolf over great racehorses. In the past decade alone, Zarkava and Sea The Stars generated abundant superlatives, yet few now dispute that Frankel is the best horse to pound the Turf in living memory. More enchanting still is that Frankel’s story transcends his raw ability. He has developed from unruly youth to consummate professional, and that transformation has been accomplished by a man who has always held the sport in thrall. Sir Henry Cecil, 69, has been champion trainer 10 times. He has won 25 British Classics­-the Derby four times. Beset by personal tragedy, he seemed on the point of a retirement forced on him by lack of success and failing health. Yet, in quelling Frankel’s explosive nature, Sir Henry has showcased not only his own talent, but that of a horse with an insatiable appetite for racing. Now a four year old, Frankel is unbeaten in 13 starts. He will run for the last time in the Champion Stakes at Ascot on Saturday (October 20), when a crowd of 32,000-the occasion was sold out weeks ago-will pay him homage. It hasn’t always been thus. 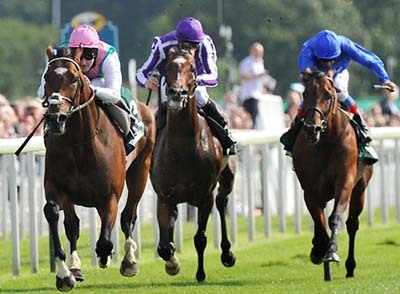 Frankel’s early victories were characterised by a burning desire to gallop headlong from the start. He won last year’s 2,000 Guineas with a front-running blitz that drew gasps of astonishment. ‘My jaw dropped,’ Mr McGrath reflects. Frankel the legend was born. However, it raised concerns over whether such an impulsive horse could pass the test of longevity required of an equine great. Frankel’s willingness to accept restraint has been a gradual process. Thanks to Sir Henry’s patience, he’s now a perfectly honed racing machine. Succumbing to Mr Queally’s demands, he has further distanced himself from his pursuers, thrilling more and more converts in the process. As the clock ticked down towards Frankel’s imminent passage to stallion duties, so the crowds flocked to see him in the flesh. When he ran at York in August he added almost 12,000 to the 19,500 who attended on the same day a year earlier. They witnessed another crushing victory froma horse who has won his 13 races by a combined total of 74½ lengths. They also saw Frankel’s robust health contrast sharply with that of Sir Henry, now a frail figure who has fought cancer-a curse that claimed his twin brother, David, in 2000-for six years. In many ways, Frankel is the equine embodi-ment of his trainer, himself a young tyro who matured to master his art. Comparing horses of different generations generates debate with no pronounceable verdict. Nor can anyone predict whether Frankel will dominate the stallion ranks. In fact, those who follow his stallion innings will do so in near-certain knowledge that he will never sire a horse as good as himself. The house will be full at Ascot because there can’t possibly be two Frankels in one lifetime.